I’m hungry after listening to that, Grannymar! You’re so right, Grannymar. Nothing whets the appetite more than coming home to the aroma of home-made food, especially when it’s been slow cooked in the oven. I’m a huge fan of ‘slow food in a fast world’. Steph I didn’t mean to make you hungry. Ah, those are wonderful memories of your mother. When I think of my mother, I see her with a phone in one hand and a pen in the other. She is a cunning business woman. 🙂 But, I do have wonderful memories of my grandmother and I working in the garden. By the way, you are making me hungry with all of this talk of Coddle, boiled potatoes, Apple Tarts, and what not! 🙂 Great post, Grannymar. Sorry to make you hungry. From now on Monday will be food day! So you did the meme. I like the CD cover. You know, Grannymar, my Mother was never a great cook, but she was a good cook and everything she served us was very tasty. What my Mother was good at was family time. Every evening my brothers and sister and I would set the table in the dining room even if we were only having ,don’t laugh,Spam. We had cloth napkins and sometimes candles, but always good conversation. I’ll never forget those times. To this day I am curious about things and want to get to the bottom of the mystery. I’m always looking things up..
Great post. When I think of my mother, I think of her ironing her nurse’s uniform and especially her hat. It had to be starched stiff as a board and took forever to iron. The uniform was starched, too, and I can remember the rustling sound it made as she walked in it. Those days are gone. The uniforms are all drip-dry and many of the nurses don’t wear hats. I’m looking forward to your Monday posts! I love when my post triggers memories for others. Thank you Nancy and Betty for sharing precious moments with me. 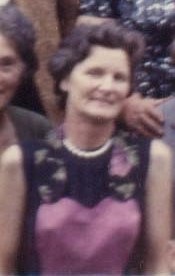 Sadly these days I not only think of my mother but ‘see’ her each evening at 11.00 walking past my kitchen window and coming in through the sliding door for a quick cuppa and a chat before going next door to bed when she worked evening shifts. She would chat about the day, still in her nurses uniform, drink two cups of tea or a hot whiskey toddy and eat something sweet. Kiss me goodnight (even though I was almost 40) and wonder off home. She was a stupendous cook and taught me all I know except how to make decent gravy – that accolade goes to my mother in law. Speaking of food though, when I was 21, a girlfriend and I went to England for a holiday. I surprised my Auntie Doris in Wales and we arrived to her setting blackberry and apple and gooseberry pies on the windowsill to cool. It was like something out of a Mother Goose story! We ate pieces of them with clotted cream. Yum. It was as if she knew we were coming but she didn’t. Baino, years ago people just called unexpectedly. The phone service was not like today and mothers/ wousewives were usually there to make a cup of tea or coffee. Now any good housewife worth her salt had cakes, tarts, buns or biscuits in her tins or pantry! They were all home made. I’m so fortunant to still have my mother (and father). They just turned 90 this year. Looking back I remember my mother sewing. Every fall she made school clothers for each of us 3 sisters. We were each given a week of her time. We had to help out an extra amount for that week as she made our skirts and dresses. I lived in Texas. We were not allowed to wear pants to school. School rules, not mom’s. We usually got to help select the patterns and fabrics for our clothes with Mother having a veto. Too expensive or too complicated. 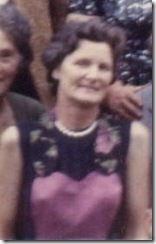 When I visit my parents now, I notice how Mother still always looks elegant. She has a real eye for clothes. PS I reviewed your blog for Time Goes By. I was glad for a reminder to stop by. Sharry, thank you for the kind words at Time Goes By. I love the accent in your podcasts !!! My mother would also be in the kitchen, with a husband and two sons to look after who cared not a jot about housework or food as long as the house was clean and the food was there upon demand any time day or night, she had her work cut out !!! Gary two sons ! My mother had four sons plus my father, my young sister and little me in the middle of the boys! We grew up thinking that cake hot from the oven was the way to eat it, and cold cake was stale! Day old cake or left overs – what were they?